I won’t say he’s the best we’ve got (I’ve gotten flack for doing that in the past). But he may be the best we have up this month. Max Grundy has made me fall in love with Gallery Stroll all over again. Grundy’s show at the Unknown Gallery entitled Media Fear is the type of show that gets underneath your skin and stays with you long after you have made your way out the door with as much free grub as possible. Grundy’s new show takes its inspiration from a slogan you’ll find imprinted on t-shirts, pullovers and caps available within the gallery: “Fear is the New Beauty.” The simplicity and the paradox of this statement are the perfect summation of what is going on in this show. You won’t find any of these works beautiful. They are thought provoking, yes, and the intellectual can have its own sort of beauty, but it’s not even that. You’re not going to find any eloquent statement or post-doctoral thesis in these works. They are visceral, shockingly simple and insipidly disturbing. These works are “beautiful” because they have a certain power over you. They get into your eyes, lodging somewhere around the optic nerve, where they both prick and massage your brain at the same time. There is absolutely no beautiful painting here. In fact no painting at all, except two works, but I think these can be dismissed out of hand. There are no gorgeous materials, no fragile papers or sensuous inks. The works are prepared digitally and printed as giclee on vinyl. What could be more UN-fine art, right? But, well, that’s the point. Grundy, who graduated with an M.F.A. 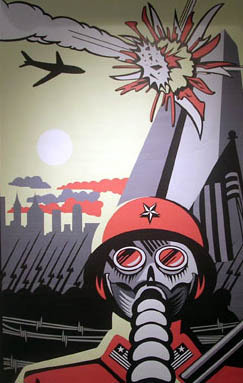 from B.Y.U., was inspired by his study of propaganda for this exhibit. The works are done in the style of Soviet-era propaganda posters and banners, the type of things that would drape tall buildings (kind of like those banners during the Olympics come to think of it) or be plastered all over city walls. They are the very emblem of an American idea of the cold and gray Soviet Union forty years ago. Only thing, is, Grundy has recontextualized the whole thing and dropped it into the 21st-century American psyche. 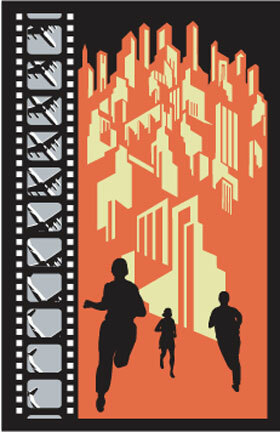 In “Media Fear #2” we see the trajectory of a plane crashing into two large skyscrapers, obviously the twin towers.|2| In “Media Fear (Run)” we see three silhouetted images of people fleeing against a skyscraper background with a film negative of a moving airplane seen on the side. |3| Grundy has tapped into the images that have propelled our consciousness in the post 9/11 world. Look at “Media Fear #2.” |4| Who would think that a gas mask would still have the ability to terrify? It’s so World War II, right? So, well, European, so mustard gas and all that. But that image of a gas mask reaches inside the chilly parts of your consciousness. It is not just the literal use of the mask -- would a gas mask save us if there was a chemical attack? What about a biological attack? Grundy’s inversion of propaganda makes you wonder if the mask isn’t so powerful because it is the symbol of our fearful souls. It is ourselves, trapped in the confined world and limited vision of the very thing designed to protect us. This consciousness has been greatly driven by the media, which in our age is dominated by the visual. 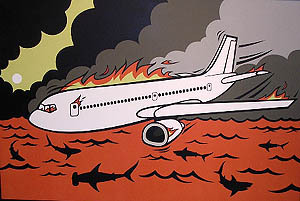 If there had been no footage of that awful scene of the planes crashing into the twin towers, if it had not been shown over and over again until it stopped turning our stomachs and became an emblem, a rally cry, would we have gone to all the trouble in our foreign “excursions”? Grundy’s works are engaging the media’s penchant for magnifying and multiplying images that create fear. They do it, because, well, we like fear. It makes us feel alive. It’s kind of beautiful in that way. Grundy’s works de-construct this beauty. Grundy’s style is so simplistic as to be self-effacing. But it is the materials and means that is part of the message. Part of the message is a warning sign of the dangers of simplicity. Take, for instance, the “Commandment” works. In “Thou Shalt Not Kill” we see imagery of dead bodies, crosses marking the graves, as warplanes fly overhead. I can just hear someone of a religious persuasion, in an attempt to justify American bellicosity, saying, “But wait, it’s not that simple.” But isn’t it? “Thou shalt not kill” is as simplistic as “the war on terror.” It’s always simplistic one-sided slogans that we throw around and beat each other up with to get our way. That’s just it. Sometimes we love simplistic slogans. We like the appeal of propaganda because in its flat, evenly colored simplicity it frees our minds from complication. Grundy inverts this simplicity with his style. 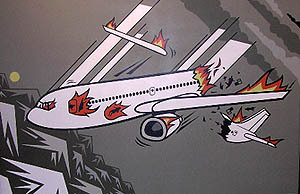 In a few of his works he shows planes being destroyed, blowing up in midair or crashing into the water. The style is the same one used in those airplane cards that tell us to calmly place the oxygen masks on our face in the case of a drop in cabin pressure. |5| But Grundy shows us what is really going on in our mind, the deep-bedded fear that many have when flying and the more general post 9/11 fear of airplanes. Go see this show. You won’t need to take the time to examine details of a master craftsman’s hand. But you’ll find yourself standing in front of these works. You’ll immediately recognize the imagery. But unlike most art you’ll see this month, the images won’t quickly leave your consciousness. The work will stay with you, working itself through your mind. And next time you see the news, maybe you’ll see that newscaster in a gas mask. Media Fear continues at the Unknown Gallery through October 14th. Empty Bowls is the annual fundraiser of Clay Arts, Utah. For this fundraiser Utah artists have donated beautiful, handmade bowl. Participants will enjoy a simple meal of soup and bread and then choose a bowl to take home as a reminder of all the bowls they helped to fill with their suggested donation of $15. All proceeds go to Catholic Community Services for their programs to feed the hungry. The event is Saturday, October 15th, noon to 6:00 pm at the Sugarhouse Garden Center, 2100 South 1400 East, SLC. If you have enjoyed this edition of 15 Bytes, please consider contributing to the magazine or becoming an underwriter. Contribute now and help support Utah's growing visual arts community. Compiled by 15 Bytes Staff. Unless otherwise noted, UPCOMING shows begin October Gallery Stroll, October 21, with a reception 6 to 9 pm. SALT LAKE ART CENTER: Opening October 15: The Salt Lake Art Center will present, in both its Main and Street Level Galleries, an exhibition of works by internationally known artist Jun Kaneko. A respected and highly influential artist in the realm of ceramics and design, Kaneko is perhaps best known in Utah for the large public commissioned work, Salt Palace Wall, made of several hundred hand-made ceramic tiles in the primary corridor of the Salt Palace Convention Center. Kaneko’s prodigious body of work, his diversity, his use of color and attention to patterns are recognized throughout the world. Born in Nagoya, Japan in 1942, Kaneko immigrated to the United States in the early 1960’s and currently resides in Omaha, Nebraska. He has been working for more than 35 years in the disciplines of ceramics, painting, drawing and installation. Our exhibition will include a ceramic tile wall, large ceramic objects, a site-specific installation and large scale drawings. Because of the large scale of many of the pieces, the exhibition will be an ambitious one for the Art Center. It is the fourth major project presented in this country since 1986 which combines the talents and skills of Kaneko and Curator Ric Collier. It will be accompanied by a small publication, a series of Art Talks Lectures and projects based on the exhibition in our ArtWORKS and KidsmART youth education programs. UTAH MUSEUM OF FINE ARTS: "The Art of the West: Reinterpreting Western Images," featuring art from the museum's collection and works on loan from local collectors. Also Africa: The Arts of a Continent, featuring works from the permanent collection of the UMFA. MUSEUM OF UTAH ART & HISTORY: Large Scale Paintings from the State Fine Art Collection displays selected works from the Utah Arts Council. Over twenty artists are showcased in this exhbition, from nineteenth-century painters like Mahonri Young and H.L.A. Culmer to contemporary artists like Brian Kershisnik and Lee Edall Bennion. Continues thru January 15, 2006. A GALLERY UP: Sculpture group show (see page 5). UPCOMING: Brent Godfrey 'A Path to the Self'. The artist says: "Cumulatively, these paintings form a record of the passing of time; the fuzzy visions of memory, the richness of the present and the murky mingling of the two. They are a record of paths taken or considered; freeways leading out, roads leading up, then down, sometimes winding back, other times heading off beyond imagination. With more and more miles behind me now I find myself considering the trip. It is true, as I've been told, that all my roads converge at me. The unexpected realization is that my arrivals continue to hold surprise." E STREET GALLERY UP: Kevin Frazier’s Raku Wall Hangings. The unique ceramic works offer a visually exciting alternative to painting. In addition to his wall hangings, the artist will exhibit vases, bowls and platters. WASATCH FRAME SHOP UP: As part of their Emerging Artist Series: 'Invented Environments": drawing, paintings, and lithographs by P.J. Woods. KEN SADNERS RARE BOOKS UPCOMING: Red Rock Yellow Stone Photographs of the Colorado Plateau and the Greater Yellowstone and Haiku by Ed Firmage. UTAH ARTIST HANDS: UP: "Can't Let Go," the works of David Maestas have been held over for another month and include new works. UPCOMING: "Shawn Rossiter 5: Scenes from Italy, France, Spain, Mexico & the American West." HORNE FINE ART UP: Skyscapes, featuring paintings of the shifting drama of sky by over a dozen Utah artists including Doug Braithwaite, John Berry, Laura Boardman, Rob Colvin, Traci O'Very Covey, Karen Horne, Phyllis F. Horne, Anne Weber, and Jennifer Worsley. Also, new works by Antony Cox. UPCOMING: Moving Inside featuring interiors and still lives. PHILLIPS GALLERY: UP: Paintings by D.H. Brinkerhoff & weavings by Sharon Alderman. UPCOMING: Connie Borup: New Paintings and Monoprints. MUSEUM OF CHURCH HISTORY AND ART Rembrandt: The Biblical Etchings, featuring rare biblical etchings by the great 17th-century Dutch master, through Dec. 11. Also Joseph Smith: Prophet of the Restoration, featuring historical documents, works of art, period artifacts and more, through Jan. 15, 2006. Also Follow the Prophet, featuring images created by LDS children, through Feb. 27, 2006. Also "You Have a Family Tree," featuring interactive children's exhibit, through Feb. 5, 2006. ROSE WAGNER ARTS CENTER : UP: "Still Standing/Standing Still" historical urban scenes by G.J. LaBonty and desert landscapes by Royden Card. October thru December. Reception Friday October 14th, 6-9pm. The October edition of Salt Lake Magazine features an article by Jennifer Millett entitled "Art Shopping Savvy" as well as a short profile of Salt Lake Art Center's Leslie Peterson. 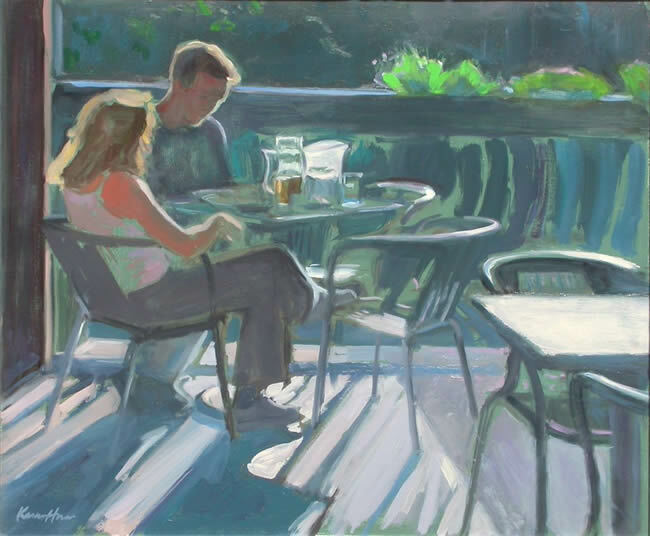 The October edition of Southwest Art features Karen Horne as one of a group of artists depicting cafe life. 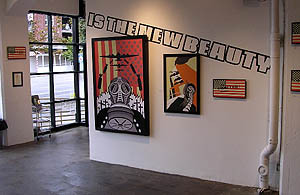 UNKNOWN GALLERY UP: Fear is the New Beauty a solo show by Max Grundy(see article at left). LOCAL COLORS ARTWORKS (Trolley Square) New location in Trolley! Steven Sheffield painting; Mike and Penny Stevens blown glass; John Collins painting; Dottie Miles Painting and Jack Bowman glass. 814 GALLERY (814 East 100 South, 801.533.0204) "Chronicles of the Day After Yesterday," photographs by Celine Boddy-Downen. Opening reception Saturday October 8, 200, 6 to 9 pm. VISAGE SALON (2006 S. 900 E., 860-4333) UP: Watercolors by Daniel A. Nielson. 3W GALLERY (159 W. Broadway) UP: Photography by John Richards. ONE MODERN ART Selected works at reduced pricing. So if there is a piece that you have been wanting, now is the time to acquire it before it is gone. MAGPIE'S NEST GALLERY UP: New still lifes and landscapes by David Estes. CONTEMPORARY DESIGN & ART GALLERY UP: Joe Bankhead and his Journey Beyond Thoughts series. ART BARN/FINCH LANE GALLERY : UP thru November 4 Tom Bettin & Tim Dolan, prints / sculpture / poetry and John Erickson & Thomas Hoffman, paintings. PATRICK MOORE GALLERY UP: Arts of Fiber 2005: Utah Design Group Juried Show. UPCOMING: Salt Lake Assembled Printmakers 2005.